The gambrel shed has a long and varied history. Originally built as a barn in the American colonies by early Dutch settlers, this style of roof has also become popular for projects including homes and of course sheds! As a storage shed a gambrel roof can make the very most of a small amount of space. The interior can be left completely open to the roof or an attic space included for an extra storage level. They are now made of modern materials and utilise modern methods of construction which mean that you may have a shed that is both sturdy and classic at the same time. So, what is it that defines a shed as being a gambrel? The roof itself is the feature that determines the designation of the shed. A gambrel roof is one that is normally symmetrical and has two sides. Each side has two slopes. The upper slope is usually positioned at a shallow angle but the lower slope can be very steep. This is what gives the gambrel shed the space advantage by maximizing the amount of head space available in the shed's upper level. 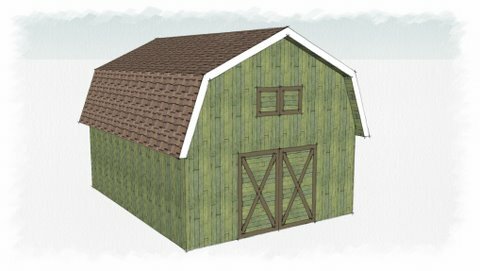 If are going to build your own gambrel shed then you need to be able to determine the setting out of the roof slopes. The gambrel roof pitches can vary considerably and many ways of setting out can be can be given. In the sketches below are two methods which give a good result. In the first method the perimeter of the semicircle is divided into 4 equal parts and each point is then joined to form the roof profile â€“ known as a demi-octagon. For method two the perimeter of the semicircle is divided into 5 equal parts, the two lower intersections and the top of the semicircle are joined to form the roof profile. Once you know the size your gambrel shed will be and the pitches of the roof you can begin thinking about what sort of features you would like to have installed as part of it. There are many features that can be added depending on what you intend to use the shed for. If you are looking at creating a shed that is beautiful as well as functional then you might consider installing wood shingles rather than the basic asphalt ones that most people tend to use on this type of shed. Wood shingles can lend a much more classic look and can be found in many different shades as well. Another feature that can be installed in a gambrel shed is a skylight. This can allow you to have a good deal more light in the shed without having to constantly turn on a switch. Skylights are great for artists shed which often benefit from lots of natural light. Depending on the size of your shed the use of roof trusses can enhance the benefits to be gained in a couple of ways. First it can help to better handle the weight of the roof when compared to the tensile strength of traditional timbers. Another benefit of trusses can be found in the fact that you can store more items in amongst the trusses than you could with old fashioned rafters. Other features that you can add to your gambrel shed including sliding doors that will allow you to store larger objects in your shed. Like the sliding door on a barn these can split to each side if in pairs and allow you to park a ride on lawnmower inside as well as other large pieces of equipment. If you will be using the shed as a garden office then you might consider installing several windows. A gambrel shed can be an excellent addition to your property. It will allow you to enjoy the maximum benefits of a shed plus the added benefit of increased storage space in the roof.